Down the Rabbit Hole Live! 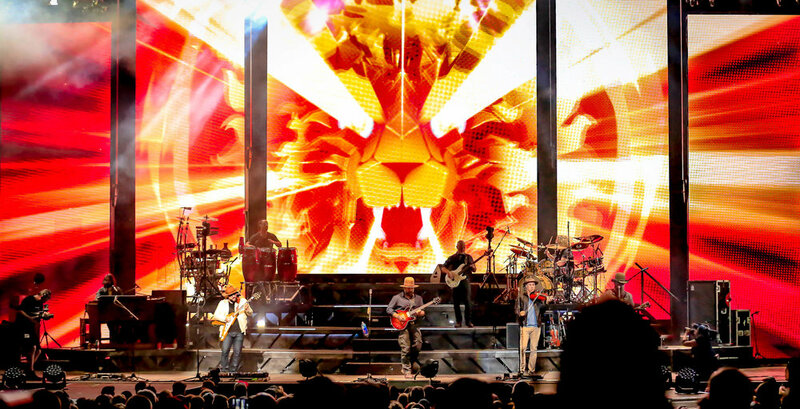 Tour 2019 / Virginia Beach, Virginia, U.S.
Life was good on a Friday night when I walked into the amphitheater in Virginia Beach for the much-anticipated, 20,000-capacity outdoor venue’s debut concert of the season. The moment I saw the massive stage setup, I knew I’d better buckle up for a stunning sensory overload. Starting with several carefree songs about beach life, the 3-time GRAMMY® Award-winning Zac Brown Band praised those light-hearted times we all know and love here on the U.S. East Coast. The crowd filling up the Veterans United Home Loans Amphitheater sang along with every word. However, Zac seemed anything but carefree about his nearly 30 songs selected for the night. Like a beast uncaged, he defied all genre labels. Whether performing an original song such as “Day for the Dead” or covers of legendary artists such as “Devil Went Down to Georgia” by Charlie Daniels Band, and "Bulls on Parade” by Rage Against the Machine, the expertise of all eight band members on their array of instruments was nothing short of jaw-dropping (see band members and setlist below the gallery). My personal favorite out of the 12 cover songs was a classic, “Life in the Fast Lane” by The Eagles. Of course, “Chicken Fried” stood out as the fan favorite, especially when our military was honored halfway through with a beautiful tribute. As you can see in the images below, gorgeous scenery and captivating graphics delighted fans and photographers alike on this Virginia stop of Down the Rabbit Hole Live! tour. Zac entertained with the perfect blend of carefree country with all the feels, and fiery southern rock with screaming guitars. However, this free-spirited artist may surprise you with his next album. Newer PostSHEL and The Accidentals Melt Minds and Hearts!